As recent events in Japan, the Middle East, and Haiti have shown, Twitter offers a unique platform to connect individuals and influence change in ways that were unthinkable only a short time ago. Twitter for Good is a groundbreaking book that contains the most effective tactics for tapping into the power of Twitter as a real-time information network. 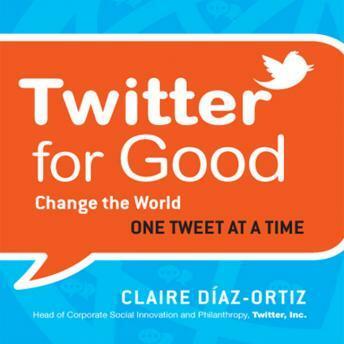 Claire DÍaz-Ortiz, Twitter's head of corporate social innovation and philanthropy, shares the same strategies she offers to organizations around the world. In her time at Twitter, DÍaz-Ortiz has worked with such forward-thinking organizations as Nike, Pepsi, the United Nations, the American Red Cross, charity:water, Room to Read, Partners in Health, the Skoll Foundation, National Wildlife Federation, Kiva, and many, many more. Filled with dynamic, global examples, Twitter for Good shows how the world's top organizations use the power of Twitter to make a difference. Through DÍaz-Ortiz's T.W.E.E.T. model, which she developed to teach organizations how to excel on Twitter, she lays out the exact framework she teaches around the world. With more than 200 million users world wide, Twitter has established itself as a dynamic force, one that every business and nonprofit organization must understand how to use effectively.